Just call me the cat herder. I was fascinated. Helping others is part of my makeup. If someone needs a hand, I'm more than willing to pitch in. A friend of mine, Don (not his real name), had been helping Al (not his real name) move to a new apartment. Don lost his cool with Al and asked I'd take over to finish the job the next day. 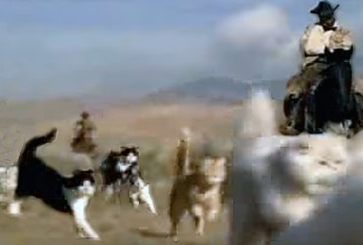 On Thursday, I found out that moving the mentally ill is like herding cats. This is another All My Donuts story. When I got to Al's old apartment a little after 10 am, Jacob (not his real name) was there. This combo of Al and Jacob was going to be challenging. Al is in AA, he's also an epileptic and has had a couple brain injuries. His attention span is that of a flea. Jacob has some sort of nervous condition. He's paranoid, quirky, erratic and always seems to be flapping his arms like a chicken. I am not without my issues. I'm bipolar, have anxiety disorder and am ADD/ADHD. So, you put together three guys who take lots of medications and just about anything can happen. Five minutes after I arrived, I saw that I was going to have to be the leader of the group. Al had about a dozen large garbage bags filled with clothing and personal items. He had five or six small boxes, a sewing machine table that he used as a TV stand and a small TV. This should have taken about 10 minutes to load into my truck and we could be off to the new apartment. NOPE. Al kept walking around in circles and explaining the history of various items in the apartment. "I got this backpack from my neighbor. She's such a good person." "These pieces of wood are from the bathroom cabinet. Some rowdy people broke it one night." "I have to dust the mirror before you move it." Meanwhile, Jacob, who is about 5' 3" tall, was flapping his arms. His brown curly hair poured down to his shoulders from his ball cap. He kept running in and out of the apartment. "What should we do? Al's not moving. I don't know what to take. Do you think it will rain?" It did. As soon as I got three boxes in the truck, it started to rain, hard. Jacob's arms were flailing everywhere, "Oh my God, oh my God. It's raining. This isn't going well." Al who moves and speaks at a molasses pace started in with his doomsday comments, "I knew this was a bad day to move. Maybe we should wait. Did you see this cup? I got it at a fair in 1978." I went out, removed the boxes from the truck, put them under shelter and asked if Al had any plastic bags. While I was trying to get Al to stop explaining things to me and answer my question, Jacob ran to the bar next door and asked if he could buy bags from them. Al got upset, "What are you doing that for? Don't talk to those people. I don't want them knowing my business." "I got the bags for free, Al," announced Jacob. "Everything will be alright." I tried to get Al to focus. "Are these bags garbage or going? Are these bags garbage or going? Al, these bags - trash or travel?" "Did you see this clock. I really like this clock. Don't let me forget my teeth." Al didn't have his upper teeth in, which made it harder to understand him. "Boy am I glad I took my seizure medication before we started. That should help," he sighed. I finally got Jacob to work with me and we started putting everything into the giant green bags he got from the bar. That was working out great. The ten minute job was now about an hour running and we were still getting roving tours of cracks in the floor from Al and flapping from Jacob. "Garbage or going?" I tried to remain focused through the confusion. Al decided to put his medications in a plastic grocery bag. Unfortunately, Al forgot that he has this habit of not securing the caps on the medications. As he threw the bottles in the bag, the pills were flying everywhere, "Oh no. Gee. I should have thought about that. What should I do? Do you think I should take one of the microwaves?" "Look, Al, the big bags are working great. They're working great," cheered Jacob as he was trying to get Al to calm down. I remained calm the whole time. I just kept moving what I could, when I got the green light. I don't think Al moved a single item. He just kept wandering from room to room, explaining things that had nothing to do with moving. Jacob would run outside, "I can't take this anymore. He's driving me nuts. I have to sit in my car." Un-phased by the commotion, I kept picking things up and loading them in the truck. The ten minute job was finally completed after about 90 minutes. I had to remind Al to put in his teeth. When he came out of the bathroom and smiled, his bridge only had two teeth in it. He said, "I look like a hockey player. I got these at the VA." Apparently, the dentist at the VA doesn't know how many teeth go in a full upper set. Got bless our government and they way they take care of vets. Then, we headed to Al's new apartment. You'd think that would be simple. Al and me in the truck, Jacob in his car - just drive to the apartment. NOPE. A debate started about whether we should take the highway or take surface streets to avoid anything flying out of my truck. I had packed everything very tightly and had some bungee cords strapping the highest items down. After another ten minutes, we came up with a plan to take the highway because it would be a lot quicker. Jacob gave me thorough directions. Then, he said, "You can follow me. I don't go real fast. I'll keep it around 45 mph." What? I don't drive 55 or less anywhere. I told Jacob to meet us there. Al and I drove the speed limit and got there quickly. We waited in the parking lot for about 15 minutes before Jacob showed up. "You wouldn't believe it. After giving you all those directions, I missed the exit. I had to drive way down the highway to turn around." But we were finally at out destination. I pulled my truck to the service elevator and we began unloading. Jacob decided that I should wait with the items they couldn't fit into the elevator and the he and Al would make the first run. After 15 minutes, Jacob comes bursting out of the elevator, "I need a break. I can't take it anymore. Sorry. I just need a break." His arms flapping as he paced around the parking lot. I grabbed Al and just told him. "Al, we're moving. Grab this stuff." He did. As long as I kept giving him commands, he stayed on task - relatively. The whole time we were in the elevator and going down the hall to his apartment, he was explaining how the front desk worked, when they painted the apartment, that his phone was being hooked up tomorrow. We got to his door and I hauled everything in. "There, we're done." "Oh that's wonderful. Did you see the view here. And look, I have closets." "And a nice bathroom, too." Al was finally in his new place. He kept telling me, "You're so calm." I had no choice. Two-thirds of our group was bouncing off the walls like balls at a racquetball court. If I wasn't careful, I'd take another ball to the head. Since I have my own mental conditions, I really can't make fun of these guys. But I learned a lesson a long time ago, Turn frustration into fascination. Moving the mentally ill was like herding cats - and I was fascinated.